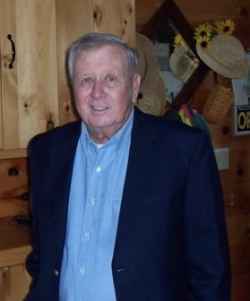 John Clark Kendrick passed away Sunday, February 5th, 2017, in Inverness, Florida following a brief illness. He was born in Burlington on June 27, 1933, the son of the late Jack Boyce and Flora (Clark) Kendrick. John was raised in St Albans and graduated from Bellows Free Academy, Class of 1951. After three years in the U. S. Navy, John graduated from the University of Vermont. He spent the majority of his career with the US Customs, stationed for five years at Montreal's Dorval Airport. Subsequently, John was a Custom's Import Specialist in St. Albans. In retirement, John and his wife, Deanna spent their summers lakeside at the Georgia Shore, and wintered in Florida. John is survived by his wife, Deanna; daughter, Heidi Sieloff and her husband, Eliot and their two children, Benjamin and Allison; his son, J. Halsey Kendrick; and his sister, Joyce Weldon. Currently there are no services planned. An on-line guest book for John is available at www.healdfuneralhome.com.